One of the biggest concerns and controversies of our time is the issue of climate change. As I understand it, there is an almost universal concensus among scientists (in the relevant fields) that climate change is happening and that it is caused by human activity – the burning of fossel fuels to bring much needed energy to our modern human societies is leading to massive environmental destruction brought about by ‘global warming’. There are, of course, those who deny this, those who simply do not believe what the majority of climate change scientists tell us. Many of these people are willing to accept that climate change is indeed taking place, but they deny that it has a human cause. After all, some of them say, our planet has a history of climate change dating back long before human beings walked the earth. I started this piece by quoting a philosopher, and I’m very tempted to carry on in a philosophical vein by talking about a branch of philosophy called ‘epistemology’ (that’s a good word to slip into any conversation!). Epistemology is to do with the theory of knowledge. It asks, How do we know what we know? For those of us who are convinced that climate change is indeed caused by human beings, the obvious question is, How do we know? The same question applies to those of us who are just as convinced that climate change does not have a human cause. How do we know? If you are a scientist who specialises in climage change, you can make careful observations, compare them, and then try to develop a theory. You can then test that theory by making further observations to see if there’s anything happening that might prove it wrong. But if you continue to observe the same patterns repeatedly with no exceptions (if you establish an ‘empirical regularity’), then you can be pretty sure that your theory is right. But, there is a problem. Did you do all this work on your own? Did you conduct all the observations yourself? Did you do all the analysis of these observations yourself? Or did you have to rely to some extent on work undertaken by other scientists or technicians, work that you weren’t in a position to supervise personally? If it’s the latter, then you only know what you know because you are convinced by the work of other people. And that is the same for all of us. In most cases, we only know what we know because we are convinced by what other people have told us. We are not always (or even usually) able to test things out for ourselves. For what it’s worth, I am convinced that the changes currently taking place in the world’s climate are indeed a reality and that human behaviour is responsible. But how do I know? That fact is, I don’t know, I’m just sufficiently persuaded to accept what a particular kind of authoritative figure tells me. (I also think it’s not worth taking a chance over something so potentially catastrophic.) For someone who denies climate change, the situation is pretty much the same. The denier doesn’t actually know that climate change is false, he or she just happens to be persuaded by the arguments of a different kind of authoritative figure. But, as Hereclitus said, ‘No man ever steps in the same river twice, for it’s not the same river and he’s not the same man.’ Hereclitus knew this (I assume) because he had experienced or observed it (or something similar) for himself. ‘And this I knew experimentally,’ said the seventeenth century figure George Fox. He was speaking of personal religious ‘revelation’ (not the sort of thing you can prove to anyone else), and he knew what he knew ‘experimentally’. Like Hereclitus (so I assume), Fox was convinced by something because he had experienced or observed it for himself; he was not convinced because someone else had told him what to believe. In fact, we all know about change ‘experimentally’ (or so I’m told!). We may not know very much about climate change – apart from seasonal variations – but we do know about change in general. Change happens. It’s reliable. We know this experimentally. Given the often difficult subject matter I try to address in my writing, I find it very encouraging that the one thing that we can all rely on is change: some things may deteriorate and get worse, but there are many things that can develop and improve. It’s no secret that my book Delivered Unto Lions, though presented in the form of a novel, is closely based on events that took place at a former mental institution in Somerset called Merrifield. Merrifield Children’s Unit was, if you like, the partially detached young patients’ arm of Tone Vale Hospital, an old asylum-style institution. Both Merrifield and Tone Vale were closed in the mid-1990s following the rise of ‘Care in the Community’. 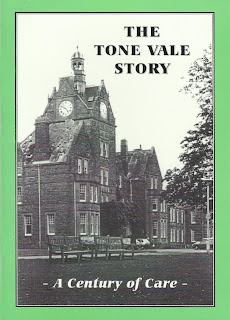 Within two years of the closure of Tone Vale, editors David Hinton and Fred Clarke compiled a slim volume chronicling some of the hospital’s history. The Tone Vale Story: A Century Of Care is the kind of publication you might expect from a local history society, i.e. competently-researched, slightly antiquarian in flavour, and presented with the keen initiative of local history enthusiasts. Some readers will be familiar, by association, with co-editor Fred Clarke. His brother was the science fiction author Arthur C Clarke. Indeed, The Tone Vale Story is published by the Clarke family’s own organisation, the Rocket Publishing Company. The Tone Vale Story covers the opening of the asylum in 1887, various key figures associated with the development and running of the place, and architectural and topographic observations, many of these being illustrated by vintage photographs. Some of the children, although highly disturbed, were extremely well read and educated. A local author, when invited to lecture to them, found that one or two knew nearly as much about his subject, science fiction, as he did! It is, perhaps, too easy to take issue with parts of this. Firstly, the phrase ‘autistic and other emotionally disturbed children’ is misleading, as autism is a neurological condition, so it gives entirely the wrong impression to then add ‘and other emotionally disturbed children’. Secondly, labelling all Merrifield patients as ‘highly disturbed’ seems to unjustly brand young people who, in reality, were suffering problems of varying severity covering a broad range of emotional, psychological and neurological conditions. The local author who made these observations, I happen to know, was actually Fred Clarke himself. I know this because I was there! In the Spring of 1979, when I was 15, he came to address a group of patients and staff about the work of his more famous brother. Putting my criticisms to one side, I remember Fred Clarke’s visit with fondness – he was a genuinely pleasant man. I particularly remember him showing us the handwritten manuscript for Arthur C Clarke’s first novel, The Sands of Mars. My girlfriend of the time (don’t tell anyone I had a girlfriend – it wasn’t allowed at Merrifield!) commented on the neatness of the handwriting. Fred, however, in an entertaining brotherly way, dismissed Arthur’s handwriting as an untidy scrawl! As a result of that occasion, I was invited by Fred to meet his highly-renowned brother in the August of ’79. It was a slightly bizarre occasion which took place at the Clarke family house (which was very close to Tone Vale and Merrifield). The well-known author was in the UK (he was based in Sri Lanka) to promote his new television series Arthur C Clarke’s Mysterious World, and a Dutch film crew had been at the house to interview him – and I got to enjoy some of the catering! After the film crew had left, I found myself in the peculiar position of sitting with Arthur C Clarke as he watched an edition of the children’s TV programme Blue Peter (he particularly wanted to see a feature on the Egyptian pyramids). I also took the opportunity to take a photograph of Arthur, and he helpfully pointed out that you should always take more than one shot when photographing something important! It is, however, the less well-known of the two brothers who made the biggest impact on me. I remember Fred Clarke as a gentle, courteous man who shared his brother’s enthusiasm for both science and science fiction. And when I met Fred again, twenty-two years later, at the 2001 Nexus Convention in Bristol, I was surprised to discover that he remembered me. Against this background I find myself surveying The Tone Vale Story, which Fred co-edited, from a very particular perspective. I knew Fred Clarke to some extent; I knew Tone Vale to some extent; and I knew Merrifield intimately. So what does The Tone Vale Story mean in relation to unpleasant portrayals of Tone Vale and Merrifield (or their novelised counterparts) in books like Joyce Passmore’s mémoire The Light in My Mind and my own novel Delivered Unto Lions? The Tone Vale Story is very matter-of-fact in its historical/antiquarian tone. The only controversies it comes close to acknowledging are those associated with past attitudes to mental health, such as those encapsulated in the 1890 Lunacy Act. It tells the story of the institution in terms of developments and innovations, coupled with a few folksy recollections, but it does not tell the story of the institution in terms of patients’ experience. No doubt there are many former patients, both adult and child, who passed through Tone Vale or Merrifield helped rather than harmed by the experience. But there is enough personal testimony around to know that many individuals – who were already experiencing problematic conditions to one extent or another – were damaged further by their unsavoury experiences of these closely linked institutions. This is all well and good; achievements should be celebrated. But what of the darker side? Were editors David Hinton and Fred Clarke even aware that there was a darker side? Fred Clarke certainly had some interaction with the on-site authorities at Merrifield and with some of the patients (including myself), but it seems to me to be entirely likely that, despite his close proximity to disturbing events, he knew nothing of these things. I wonder how many other visitors to Merrifield – NHS and local government officials, chaplains and other supportive individuals, etc. – remained unaware of some of the damaging things that happened from time-to-time in an institution they knew relatively well. I’ve always maintained that the phenomenon of Merrifield was one kept hidden from public knowledge. Tone Vale Hospital was less well concealed, but still there was much that was kept hidden. Even for those who might have thought they knew these places – because at some point they had stepped foot inside – the full truth still remained hidden. This leads me to wonder how many other local histories and modern antiquarian writings unwittingly keep their readers out of the hidden recesses. Perhaps the unpleasant anecdote (as well as the pleasant one) deserves some space alongside the historical or antiquarian record. The Tone Vale Story: A Century Of Care, edited by David Hinton & Fred Clarke, is published by the Rocket Publishing Co. I wrote those words more than twenty-five years ago. I was a young man then, still in my early twenties. To be honest, I’ve slightly changed one line as I decided my original attempt wasn’t good enough. I’m not sure that any of it’s particularly good anyway – including the melody I wrote for it (it’s a song) – but this is it, for what it’s worth. There was a particular incident that prompted me to write those words. A work colleague of mine (a little older than me, but still a young man) had recently left our employer and taken up another position – his dream job! – elsewhere in the country. A few weeks after he left, the message came back that he had suffered a severe head injury in a road accident. I can’t remember for certain, but I think he may have been a pedestrian rather than a car-driver or passenger. Over the coming days and weeks reports continued to filter back about his condition. Eventually the news came that he had died. I’m sorry to say I can’t remember his name – this wasn’t quite the ‘death of a friend’ that I wrote about in my song. The truth is, this man hadn’t been an especially close friend of mine, but he had been a friendly, likeable colleague. Other colleagues of mine who had known him better and for longer were, of course, devastated. This left me with the luxury – if you can call it a luxury – of being able to step back and reflect on what had happened in a way that the more deeply bereaved couldn’t. And so I thought about how a man of a similar age to myself had moved away to follow the career he wanted. This was a very positive thing, something to be celebrated. But in what seemed like no time at all, it was all over. He only got to experience his dream for a short time before his life came to a tragic end, his last few weeks lived in unconsciousness. – but he was still on my mind when I wrote the words about ‘rain on the pavements’ and ‘a crack in the sky’. Is there a point to all this gloomy recollection? Well, yes. I think the point is that, one way or another, childhood and youth come to an end. Innocence of endings comes to an end. Such things can come to an end in sudden tragedy or they can just slip away gradually, almost unnoticed. Adulthood, if it is achieved, also comes to an end. But a legacy remains from anything that comes to an end. For those of us who still live, legacies remain a part of our personal existence; for those of us who no longer live, legacies remain for others. Given that endings cannot be avoided, maybe we should work harder to make those legacies good ones – challenging though that may be. Perhaps we can work towards discovering the childhood happiness that wasn’t known in life, while also celebrating and maintaining something of the childhood happiness that was. In October 2012 (just a few weeks ago, at time of writing), my wife, two daughters and I attended a weekend course on Storytelling for 8-12 Year Olds at the Woodbrooke Quaker Study Centre in Birmingham. It was a packed programme involving story creation, storytelling, dramatic improvisation and much more. Where’s he gone? Where’s he gone? Poor old Ron! Poor old Ron! With all due apologies to J K Rowling, it was great to come away from a Quaker establishment with that particular gem! One of the leaders of this weekend storytelling course was the children’s author Sally Nicholls. After we returned home we bought a copy of her book Ways To Live Forever for our eldest daughter. A few days ago, I picked it up and read it myself. Although Ways To Live Forever is primarily intended for children and teenagers, its direct and unashamedly open language make it a very worthwhile read for adults too. Sally Nicholls addresses a very difficult subject in this book – a child’s terminal illness – but she overcomes adult fears and reticence by using the frank, matter-of-fact voice of the afflicted child. The main character of the book is Sam, an 11-year-old with leukaemia, and the story is told entirely from his perspective. Through an engaging first person narrative this book explores important questions: What are the priorities for a child who knows he doesn’t have long to live? How does he perceive the actions and conversations of the adults around him? In exploring questions like these the book draws the reader into that child’s world. Obviously, this is not a happy, feel-good book, but that’s not to say that it’s entirely bleak and grim. There is gentle humour scattered throughout the story, and this helps lead the reader towards the (inevitable) conclusion. Essentially, in my view, this book conveys the message that tragedy of this kind cannot be swept away and ignored, but by ‘normalising’ it through the eyes of a child, it is shown as something that can be faced (just about). Nothing here is trivialised, it is simply expressed as normal for those experiencing it. Ways To Live Forever is a fantastic book, and one whose honesty will be especially appreciated by young readers. So, the learning experience of the storytelling course and an entertaining song about Harry Potter weren’t the only things I took away from our family weekend at Woodbrooke! In thinking about mental health – or, indeed, health in general – is there a spiritual dimension that needs to be considered? Talk of ‘spirit’ or ‘spirituality’ is a big turn-off for many thinking people these days. Here in the UK where secular and atheist attitudes seem to be on the rise (not that secular and atheist are necessarily the same thing), matters of spirit get cast aside as vague, unverifiable, or even non-existent. I make no secret of the fact that I was brought up in a Christian tradition, and I remain a person of faith (though no longer affiliated to exactly the same tradition in which I was raised). But I am also the kind of person who asks questions. Just because someone in a position of authority (religious of otherwise) says something, doesn’t necessarily mean I will accept it. The point is, however, that I draw on my particular background in trying to understand and make a case for the spiritual. In doing this, what strikes me is how ordinary and natural the spiritual is. The Hebrew word ruha and the Greek word pneuma – used in the Old and New Testaments of the Bible respectively – are both translated into English as ‘spirit’. The words ruha and pneuma are both about ‘breath’ or ‘wind’, they are about ‘motivating force’, about the ‘engine’ that ‘drives’ us – or ‘drives’ any living thing. You don’t have to be religious to recognise that life has – and is – a kind of energy. So, spirituality is about the ‘stuff’ that drives us, that motives us, that keeps us moving. But where there are problems with mental health, we can see that something about the spirit of a person is inhibited or threatened (in a less enlightened age we might have said that such a person was 'possessed' by an bad spirit!). Indeed, in any area of human life where we see things going wrong – relationships falling apart, violent competition taking over, etc. – we can see that something about the spiritual has become disordered, that it isn’t working properly. A person's spiritual motivation becomes diseased – i.e. dis-eased, not at ease. In thinking about a spiritual dimension to health, we are thinking about finding ways to make the human spirit more ‘at ease’ in order to bring about helpful improvements. This could mean different things for different people, but I would suggest that everyone might well benefit from taking the spiritual more seriously – the spirit (that ‘engine of life’) needs to be nurtured rather than ignored. We live in a world that likes to find mechanistic solutions to mechanistic problems. If someone has a mental health problem, very often we look for a fault in the ‘mechanism’ of the mind or brain and then try to fix it, either with drugs or with other therapies (sometimes we don't even look for the fault, we just assume it's there). I’m generalising, of course – mental health workers would quite rightly be annoyed at my simple stereotype of their work! But the spirit is about more than than that – it's about the whole self, the whole human race, and the whole of life all together: the spirit is life. I would suggest, therefore – and you are free to dismiss this if you think I’m talking nonsense! – that we should all work on developing the spiritual for the sake of ourselves and for the sake of one another. We may each do this in different ways using different forms of private meditation and/or collective sharing (or whatever you may call particular activities that have the same basic qualities). For the sceptics – and I could so easily be one of them – I must add that I’m not trying to sell anyone a miracle. I am merely suggesting that there is indeed a spiritual dimension and that acknowledging it (working with it, not against it) might be helpful. 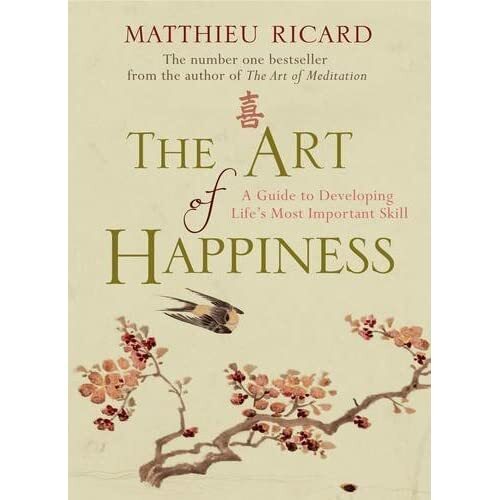 Mattheiu Ricard's book The Art Of Happiness (published by Atlantic) is a volume I would recommend very highly. It needs a bit of self-discipline to work through it — it isn’t a casual read — but it is well worth making the effort. The author is a Buddhist monk with an academic background in genetics. More recently, he has conducted research into the neurological effects of meditation. Meditation is, indeed, very much commended in this book, and the author draws on both the natural sciences and Buddhist tradition to present an approach for increasing your 'happiness skills'. It’s probably worth mentioning that the British quality press has described Mattheiw Ricard as 'the happiest man in the world' (a claim prompted by results of an MRI scan of his left pre-frontal cortex). Some readers of a resolutely secular persuasion may find the idea of some Buddhist content off-putting, as may those of other religious traditions. In fact, the Buddhist content, though definitely present (and, in my view, of interest in itself), isn’t overly emphasised. The author does not attempt to indoctrinate the reader; essentially, he is offering a methodology — and a frequently effective one at that. This book is not a miracle cure for unhappiness, but it is a beneficial “prescription” for improving emotional well-being.